Parallella, Supercomputer the size of a credit card, and passed into the category of Open Hardware. Adapteva company announced a further development of the design of the project board Parallella as Open Source Hardware. All related documentation and Parallella scheme now available on GitHub is licensed under Creative Commons BY-SA, source code FPGA HDL and software components, including drivers and SDK for developing parallel applications in C and C taking advantage of OpenCL, published under license GPLv3 / LGPLv3. Information reflects the latest version of the board, which will soon be put into production. The first 6300 copies of the summer will be sent to users, who have funded the development on Kickstarter. Fee Parallella combines compact size (approximately as a credit card, 86 x 53 mm) and low cost ($ 99) with high computing power allowing to consider the device as the tiny supercomputer, capable to provide productivity to 90 Gflops (for the 16-nuclear coprocessor – 26 Gflops). 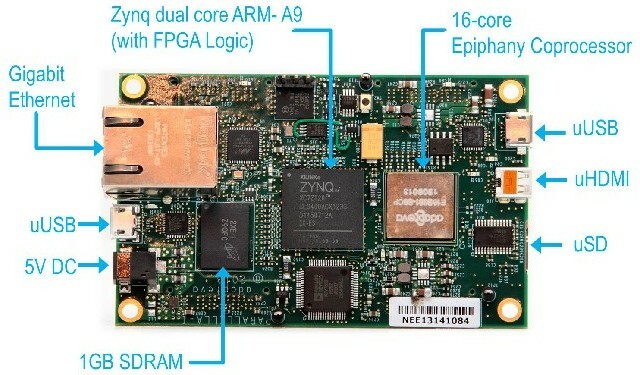 The board has a dual-core ARM Cortex A9 (SoC Xilinx Zynq7000) and 16 – or 64-core RISC-coprocessor Epiphany Multicore Accelerator. In the presence of 1 GB of memory, a slot for MicroSD-card, two USB 2.0 ports, a Gigabit Ethernet adapter, connector and Micro HDMI. Power consumption of the device is an average of 5 watts. Complete with a board will be entered open SDK for development of parallel appendices on C and C, with OpenCL involvement.